Locally well known on Lake Travis, the Leslie Ann is for sale. She is the first and one of the few 40 Outlaws with twin Mercruiser 700SCi engines and NXT outdrives. 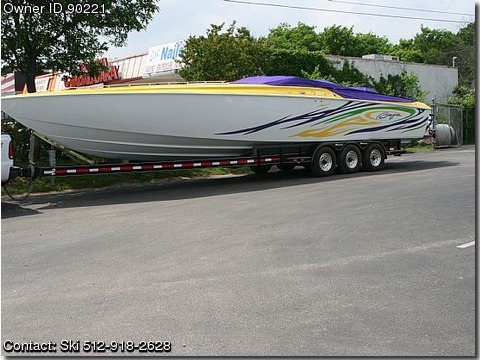 Custom ordered from and professionally maintained by the Ski Dock. She has only 116 hours on her engines. Her equipment list is exhaustive, including all available options offered by Baja. All the necessities to go fast and yet be comfortable on the lake for days. LCD computer engine monitor controller. Full galley with microwave, cook top, water heater, refrigerator and sink. Thermostatically controlled engine compartment heater. Automatic engine compartment fire extinguisher system. Enclosed vacuflush head and shower. 5 kw generator AC and Heat. Clarion Performance Plus stereo w CD changer, MP3 port, 16 speakers, 2 subwoofers, satellite radio. Flip down TV and DVD player. Dockside water, power and pump out fittings. Canvas Cockpit snap on cover. Baja logo snap in cockpit carpet. Fresh water flush and transom shower make her salt water ready, although she has never been off of Lake Travis. Swim platform with integrated ladder. Anchor locker, anchor and line 2 automatic bilge pumps. Sunpad plus the usual assortment of cup holders, cleats, rails, lights, lines, life vests, accessories, and storage. She sleeps 5, has a 296 gal fuel capacity. 30 gal holding tank, and carries 30 gal water. Mechanically and cosmetically in superb condition. An extraordinary boat that will never be made again. The configuration of equipment allows her to be considered a “second home” for income tax purposes.